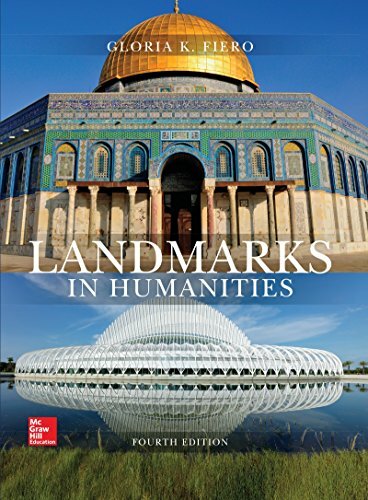 1259544923 –Landmarks in Humanities is a single-volume survey of global culture designed to help students of humanities, cultural history, and history of the arts to understand and appreciate the relevance of historical works and ideas to their own daily lives. In chronological sequence, Landmarks guides students on a journey of the most notable monuments of the human imagination and the most prominent ideas and issues that have shaped the course and character of the world’s cultures from prehistory to the present. The landmarks that mark this journey are the great works of their place and time and, in some cases, of all time. Enhanced by McGraw-Hill Education’s SmartBook, Gloria Fiero delivers a learning experience tailored to the needs of each institution, instructor, and student. With the ability to incorporate new extended readings, streaming music, and artwork, Landmarks in Humanities renews the understanding of the relationship between world cultures and humankind’s creative legacy.